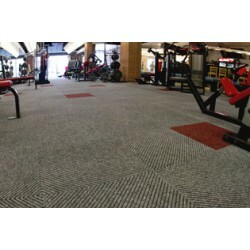 Diamond Fitness offers one type of carpet, SportWeave, which is available in two styles. SportWeave is built to withstand high traffic while maintaining its great look. First impressions of a fitness center are important, so you want aesthetically-pleasing flooring that stands the test of time and continued wear. Unlike other carpets, SportWeave does not get runners or readily absorb stains. Forget about industrial rubber floors and spend your money on a carpet with a long life and low maintenance costs. Priced per square foot. Comes in 19 11/16" x 19 11/16" squares. SportWeave™ Jazz Fitness Floo.. Priced per squart foot. Comes in 19 11/16" x 19 11/16" squares. SportWeave™ Jazz Fitness Floo..